The economic climate, new regulations and developments both here and abroad have totally changed the face of today's mergers and acquisitions. Completely rewritten and updated, it examines realistic strategies and goals for the 1990s that must be addressed in order to achieve a successful acquisition program. 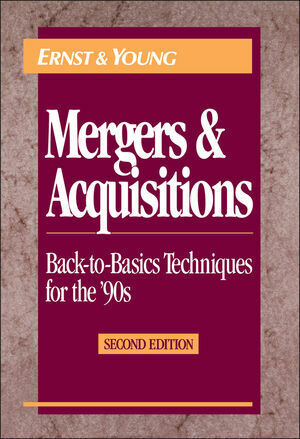 Includes coverage of the post-acquisition process, chapters on restructuring financially troubled companies, and unique strategies that apply to niche acquisitions. It also features new material on international mergers, the pros and cons of partial buy-ins, cross-border alliances, financing options and covers issues (strategic, legal, financial and regulatory) that can affect a deal of any size. ERNST & YOUNG LLP is the nation's leading professional services firm, providing tax, assurance and advisory business services and consulting services to thousands of individuals as well as domestic and global businesses. The Acquisition Process: A Program for Success (R.Bernhardt). Valuing the Potential Acquisition (S. Oesterle). Due Diligence (M. Bowne & G. Gage). Structuring Acquisition Financing (R. Wujtowicz). The Acquisition Agreement (D. Crawford). The Acquisition Process (T. Kichler). Strategic Partnerships and Corporate Venture Investments (E.Pelander).